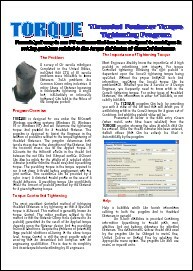 The TORQUE program is designed for use under the Microsoft Windows operating system. Will determine the appropriate tightening torque for any size of threaded fastener. Will determine the clamp force (preload) for a given tightening torque or strength utilization of the thread. Will determine the tightening given a clamp force (preload). The program accesses extensive databases supplied with the program containing thread size details and bolt material properties for both inch and metric sizes. There are also extensive databases on thread and nut face friction coefficients for a large range of finishes and commonly used lubricants. The download for our demo program is packaged in a self extracting exe file. To install the program when you have downloaded the file you need just to run it by double clicking on the file from Explorer or by using the Run option from the Start menu.